Stay away from greasy snacks that were packed ages ago and instead, choose a healthier munching option with Nutty Gritties. Their products contain all the goodness of nuts and dry fruits, and are roasted without a single drop of oil (yay). Healthy snacking, party favours, corporate/wedding gifting. We've all been in that phase where we try to eat healthy but more often than not, end up munching on oily chips or burgers with cheesy fried patties. However, Nutty Gritties is making eating healthy a lot easier. 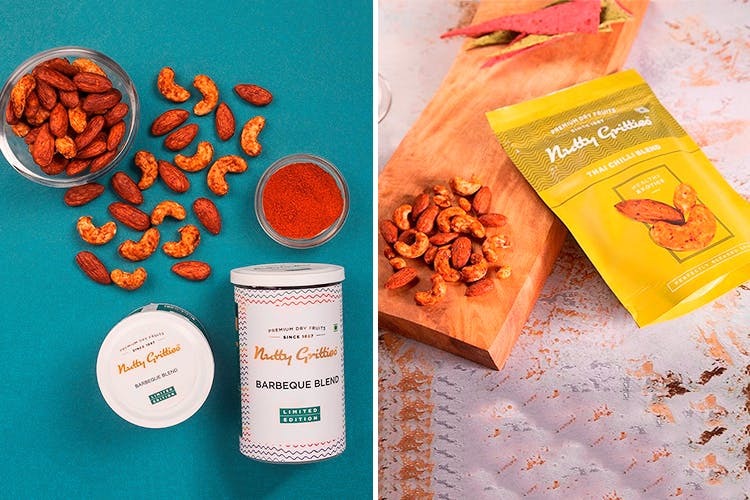 From Mangalorean Cashews and Sanora Almonds to Gourmet Trail Mixes with nuts, seeds and dried fruit slices, this brand has it all. Their range of dried fruit blends include cranberries, blueberries, figs and raisins that also make for great toppings on yogurt. Other blends include the Thai Chilli Blend (almonds, peanuts, cashew nuts and Thai spices) and the Barbecue Blend (almonds, cashews and barbecue spices). For a more indulgent snack, Nutty Gritties' barbecue or coffee almonds are perfect. In case you want to keep up this practice of healthy snacking, opt for Nutty Gritties' subscription boxes. Once you decide the frequency of delivery and the pack size, they'll bring premium quality Sanora Almonds to your doorstep. Hey, you can even add Nutty Gritties’ dry fruits and nuts to your cakes and savoury dishes for that extra taste.